(Texte traduit automatiquement) Calme studio de env. 42 bâtiment médiéval, situé dans le centre historique de Spello, juste une minute à pied de la place principale. La grande terrasse exclusive de 50 m². visages vers l'est avec vue sur la campagne, les collines et les montagnes. Une cuisine bien équipée avec four, micro-ondes, lave-vaisselle, cafetière, grille-pain. Décoré avec des meubles anciens, un lit double + lit simple supplémentaire si nécessaire, de la climatisation, ADSL + wi-fi, coffre-fort, télévision, radio. Salle de bains avec douche. Agréable et calme studio de 42 m2 dans une maison médiévale située dans le centre historique de Spello, à seulement 1 minute à pied de la place principale "Piazza della Repubblica". La grande terrasse de 50 m2, a l'est face à des vues de la campagne avec la vallée, les collines et les montagnes. Cuisine bien équipée avec four four, micro-ondes, lave-vaisselle, cafetière, grille-pain, etc. Meubles anciens, lit queen-size (lit supplémentaire pliant bébé), air conditionné, coffre-fort, TV, radio. Salle de bains avec douche. The delightful home is very well equipped with everything you need. Charm abounds. The terrace has incredible views and is a perfect setting for cocktails! Roberto explained everything and made us feel very welcome. Spello is wonderful as well. Delightful town with flowers and shops. Thank you Roberto!! We hope to return! Ottima struttura. Ci siamo sentiti come a casa, con tutti i confort a disposizione. Questo viaggio è stato organizzato da tempo per festeggiare una ricorrenza. In questo alloggio tutto è andato come previsto. Speriamo di ritornarci. Spello è un posto magnifico ed a misura d'uomo. We were looking for an apartment within a walled city in Umbria and we are so glad we decided to stay with Roberto. It had everything we needed; enough space, laundry, kitchen facilities, a great patio and a central location where we could make day trips throughout the area. 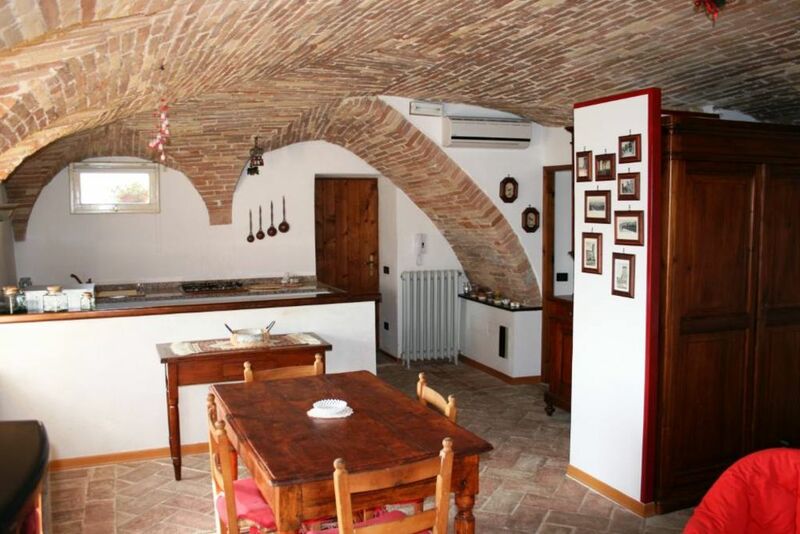 All the appliances and amenities are provided, shopping is nearby and the location within Spello is great. I would highly recommend this apartment and I would stay here again. We were thrilled with this apartment. The photos are lovely, but they can not convey the delightful ambiance of this vacation rental.....inside are the incredible brick vaulted ceilings.....the views from the window and terrace overlooking the valley are marvelous....and the tiled patio is a wonderful place for morning coffee or wine in the evening. Spello also exceeded our expectations - wonderful restaurants....flowers absolutely everywhere...friendly people....and Roberto is the perfect host! We hope to return to Spello, and we will rent this apartment again, for sure.